Why use Steel for Drop Forged Connecting Rods in Automotive Cylinder Engine? Home » News » Why use Steel for Drop Forged Connecting Rods in Automotive Cylinder Engine? Connecting rod is one of the largest volume production component in automotive cylinder engine. It works as the connection of the piston and the crankshaft and takes charge of transferring power from the piston to the crankshaft and sending it in to transmission. There are different types of materials and production methods used in creating a connecting rod. The major stresses induced in the connecting rod are a combination of axial and bending stresses in operation. Cylinder gas pressure and inertia force will produce axial stress. A whole connecting rod is made up of a long shank, a small end and a big end. When cutting the shank, we can see the cross-section of the shank may be rectangular, circular, tubular, I-section or H-section. Generally circular section is used for low speed engines while I-section is preferred for high speed engines. The most common type of production methods is casting, forging, and powdered metallurgy. Connecting rod must withstand a complex state of loading. It need to undergo high cyclic loads of the order of 10^8 to 10^9 cycles,which range from high compressive loads due to combustion, to high tensile loads due to inertia. Therefore, durability of this component is vital. Due to these factors, automotive connecting rods have been the topic of research for different aspects such as production technology, materials, performance, simulation, fatigue, etc. In modern automotive cylinder engines, the connecting rods are most usually made of forged steel for production engines, but can be made of aluminum (for lightness and the ability to absorb high impact at the expense of durability) or titanium for high performance engines, or of cast iron for motor scooters applications. 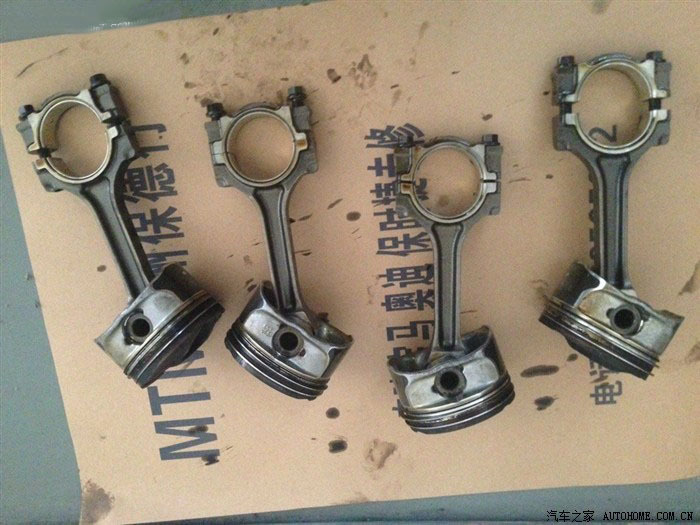 They are not rigidly fixed at eitherend, so that the angle between the connecting rod and the piston can change as the rod moves up and down and rotates around the crankshaft. The small end attaches to the piston pin, gudgeon pin or wrist pin, which is currently most often press fit into the con rod but can swivel in the piston, a "floating wrist pin" design. The big end of connecting rods will be connected to the bearing journal on the crank throw, running on replaceable bearing shells accessible via the con rod bolts which hold the bearing "cap" onto the big end. A major source of engine wear is the sideways force exerted on the piston through the con rod by the crankshaft, which typically wears the cylinder into an oval cross-section rather than circular, making it impossible for piston rings to correctly seal against the cylinder walls. Geometrically, it can be seen that longer con rods will reduce the amount of this sideways force,and thus lead to longer engine life. However, for a given engine block, the sum of the length of the conrod plus the piston stroke is a fixed number, which is determined by the fixed distance between the crankshaft axis and the top of the cylinder block where the cylinder head fastens; thus, for a given cylinder block longer stroke, giving greater engine displacement and power, requires a shorter connecting rod, resulting in accelerated cylinder wear. 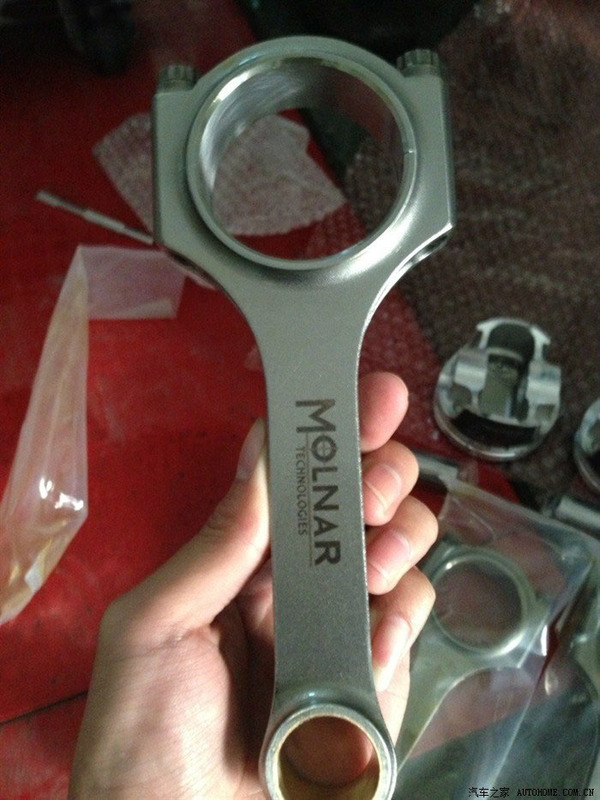 The automobile engine connecting rod is a high volume production and critical component. It connects reciprocating piston to rotating crankshaft, transmitting the thrust of the piston to the crankshaft. Every vehicle that uses an internal combustion engine requires at least one connecting rod depending upon the number of cylinders in the engine. Connecting rods for automotive applications are typically manufactured by forging from either wrought or powdered forged. They could also be cast. However, castings could have blow-holes which are detrimental from durability and fatigue points of view. The fact that forgings produce blow-hole-free and better rods gives them an advantage over cast rods. Between the forging processes, powder forged or drop forged, each process has its own advantages and disadvantages. Powder metal manufactured blanks have the advantage of near net shape and saving materials. However, the cost of the blank is high due to the high material cost and sophisticated manufacturing techniques. With steel forging, the material is cheap and the drop forging manufacturing process is cost effective. The first aspect was to investigate and compare fatigue strength of steel forged connecting rods with that of the powder forged connecting rods. The second aspect was to optimize the weight and manufacturing cost of the steel forged connecting rod. Due to its large volume production, it is only logical that optimization of the connecting rod for its weight or volume will result in large-scale savings. It can also achieve the objective of reducing the weight of the engine component, thus reducing inertia loads, reducing engine weight and improving engine performance and fuel economy. In our drop forging company, we mainly supply drop forged connecting rods for automotive cylinder engine with steel. By contrast, steel will be cost effective for application. Below we will introduce why steel is most commonly used in forged connecting rods production. To achieve high strength and light weight, we used to choose aluminum or other materials for high-rpm engines. But with the rising of material cost and design improved, designers turn back to steel. Bryan Neelen of Late Model Engines (LME) explains: “The weight below the wrist pin is not as big of a concern as the weight above it.” This is just one of the main reasons to choose steel. There are some other reasons such as cost, durability, and longevity. Another big factor is clearance. 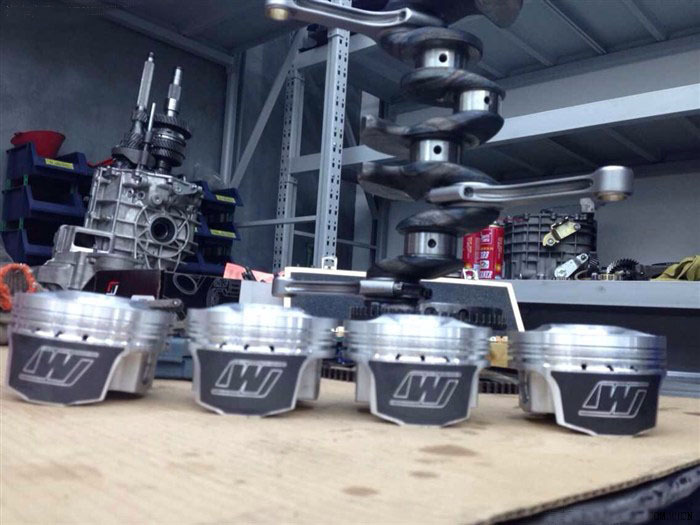 In high-rpm racing engines such as Pro Stock, valvetrain stability becomes more and more important. Pro Stock rules allow for a larger camshaft bore, and big-bore cams provide higher valve lift in addition to improving rigidity and valvetrain stability. The additional material necessary for aluminum rods will often interfere with the rod-to-camshaft clearances. By using a high-strength steel rod, larger cam bores can be utilized without interference. The most common type of steel used for high-performance forged connecting rods is 4340 chromoly steel with tensile strength 145,000 psi. Its hardness, ductility and other properties will vary based on the heat treatment applied to it. 4340 may also be referred to as aircraft grade or aircraft quality steel.